Islamists gain upper hand in Syria opposition, to blundering Washington’s dismay. 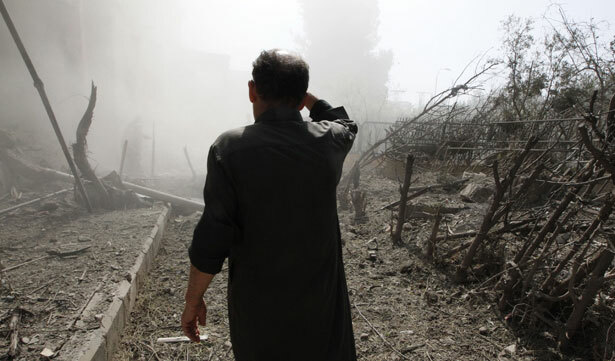 It’s read-’em-and-weep for supporters of the Syrian opposition. The whole enterprise has been on a slippery slope for quite some time, and now it’s tumbled straight down into oblivion. The “official” opposition, the so-called moderates who’ve been halfheartedly backed by the Obama administration since 2011, have been overwhelmed, it seems, by radicals, ultra-radicals and Al Qaeda types. As a result, the administration has officially suspended the supply of nonlethal aid to the Syrian rebels because, well, it’s going to the wrong guys. Gen. Idris flew to the Qatari capital of Doha on Sunday after fleeing to Turkey, U.S. officials said Wednesday. “He fled as a result of the Islamic Front taking over his headquarters,” a senior U.S. official said. The Islamists also took over key warehouses holding U.S. military gear for moderate fighters in northern Syria over the weekend. The takeover and flight of Gen. Salim Idris of the Free Syrian Army shocked the U.S., which along with Britain immediately froze delivery of nonlethal military aid to rebels in northern Syria.… Two senior officials said the warehouses taken over by the Islamic Front appeared to contain a range of lethal and nonlethal equipment. Just a month before a peace conference that will seek an end to the grinding civil war in Syria, the Obama administration’s decision to suspend the delivery of nonlethal aid to the moderate opposition demonstrated again the frustrations of trying to cultivate a viable alternative to President Bashar al-Assad.… With rebels feuding with one another instead of concentrating on fighting Mr. Assad…the United States [is] still groping for a reliable partner in Syria. It’s pretty much a complete and total collapse of the American efforts to back opposition to Assad, whose own forces have put together a string of military victories since the spring, retaking important strongholds and using aid from Russia, Iran and the Lebanese Shiite group, Hezbollah, to do so. Speaking at Transformational Trends, a conference co-hosted by Foreign Policy and the Policy Planning Staff of the U.S. State Department, Blinken said that the radicalization of the conflict may create a shared interest among world powers to bring the war to an end. The growing prominence of radical groups has “begun to concentrate the minds of critical actors outside of Syria” and may strip the Bashar al-Assad regime of the key international backing that has so far helped to keep him in power. Really, Mr. Blinken. Fact is, the United States and Russia have a joint interest in suppressing and eliminating the Islamist rebels. And that’s it. One danger is that Saudi Arabia, which is apoplectic about the impending US-Iran accord and which is equally angry about the US-Russia diplomacy over Syria, may be pouring funds into the non–Al Qaeda Islamist radicals, such as the Islamist Front, just to give the United States a black eye. If so, Washington had better read the riot act to Riyadh.